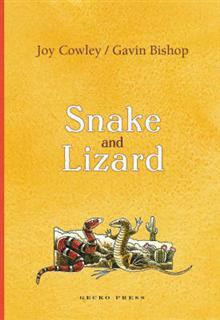 A series of stories about the friendship between Snake and Lizard. Written by Joy Cowley and illustrated by Gavin Bishop. Joy Cowley is one of New Zealand's most loved writers. She has an outstanding number of published books and awards. Gavin Bishop lives in Christchurch, New Zealand. He has exhibited internationally from Japan to the Czech Republic. His many local and international awards include: the NZ Post Book of the Year Award (four times); the Russell Clarke Medal for Illustration (twice); Grand Prize-winner of the NOMA Concours (Japan, 1984); and the Margaret Mahy Medal (2000).